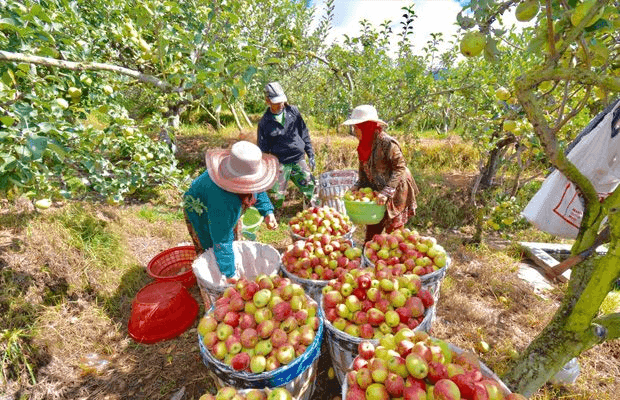 10 World's Largest Apple Producing Countries - Apple is a fruit that provides many health benefits for people who consume even many experts nutrition suggested that consumption of apples every day. But the fruit that is rich in this benefit can not be cultivated in all countries and regions. Apple plant requires the climate and soil of certain acupuncture can support its growth. The climatic conditions are suitable for the growth of Apple trees is a temperate climate that is neither too hot nor too cold that range between 16 ° C-27 ° C and need to get enough sunlight.. The most suitable soil for the growth of the Apple tree is a fairly dry clay with a PH value of around 5.5 to 6.5. The area that be covered with Apple trees is the area which is at an altitude of 1500 meters to 2600 metres. According to data collected from the Food and Agriculture Organization (FAO), the country's largest producer of apples in the world is China. China is capable of producing about 44 million tons of apples in the year 2016. The results of this Chinese Apple production is 10 times that of the United States ranked the second largest Apple-producing country in the world. In the year 2016, the United States produces about 4 million tons of apples. Being in the place as the third largest Apple producing country in the world is Poland which produced 3.6 million tons of apples. The following is a list of 10 countries Producing Apples in the world along with the amount of production in the year 2018. 0 Response to "10 World's Largest Apple Producing Countries"